Conor McCormack, Derry City, is shown a red card and sent off by referee Padraig Sutton. during Derry's last visit to Oriel Park back in April. CONOR McCormack hasn’t exactly enjoyed matches against his hometown club this season considering that one resulted in his sending off and the other an ‘embarrassing’ 5-0 drubbing on home soil. 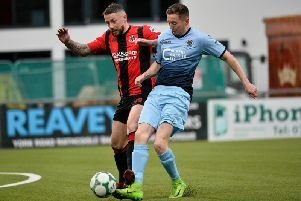 The Carlingford native was sent for an early shower in the 1-1 draw at Oriel Park in April and was helpless as Dundalk ran riot after Ryan McBride received his marching orders in their heaviest loss of the season back in July. Dundalk dangerman, Daryl Horgan in action against Conor McCormack during the 5-0 loss at the Brandywell Stadium. He’s determined to banish memories from both those clashes with a timely victory at Oriel Park tonight which would have significant ramifications in the both the race for the title and for Europe. The ‘Candy Stripes’ are unbeaten since that one-sided encounter at Brandywell in the summer and McCormack believes Derry have the confidence to exact revenge when the teams meet for a third time this season. The midfielder grew up going to Dundalk matches with his father and so he always relishes playing at the venue and testing himself against the league’s best players. We haven’t been beaten in the league since the last time we played them so we’re on a high. Confidence is high at the club and we’d like to get one over them in the league. “It’s my hometown club,” he added. “I grew up watching them. My dad used to take me to the games. “So I love going there to play, especially in the last few years as they’ve won the league and dominated the main trophies. There’s so much riding on this game for both teams with Cork ready to pounce on Dundalk and Rovers breathing down the neck of Derry. But McCormack believes Derry have the ability to ‘get one over’ his hometown club tonight to leave them in a strong position going into Tuesday night’s massive clash with Shamrock Rovers at Brandywell. While Kenny Shiels claimed the 5-0 defeat to Stephen Kenny’s men hasn’t entered his thinking in the build-up to this colossal clash, McCormack admits it will have a bearing on how the players approach the match. “It does play a part in the way you approach this game (the 5-0 loss). With memories of his sending off at Oriel still fresh in his mind, McCormack has called for the match official, Mr Paul McLaughlin to be strong and allow the game to flow. “Spectators and the travelling fans will be hoping to see a good game of football between two good teams. So hopefully we get a good performance from the referee.